Earlier this week, Barrie Mayor, Jeff Lehman, was a guest at the Barrie Chamber Board meeting to bring greetings from the City of Barrie, and to swear in the new Board. Mayor Lehman spoke about the priorities of Council, the intent of restructuring at City Hall in recent years, and the hope he has for further strengthening the Chamber-City partnership. It was a very positive encounter, and the Board are wholeheartedly looking forward to working more closely with the City of Barrie in the coming months. On Tuesday, September 29th & 30th, 2015, the Barrie, Innisfil, Oro-Medonte, and Springwater chambers are partnering with local media to host All Candidates Meetings for the upcoming Federal election in the two new Barrie area ridings. These events will be televised on Rogers TV. All candidates registered at this time have been invited. We need your help to make sure that these meetings are of interest to our members and area residents, covering topics that are relevant and useful. 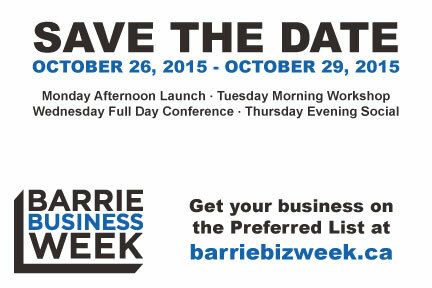 In its second year, Barrie Business Week promises to deliver a week of relevant and practical content, networking, and business connection opportunities to celebrate and support Barrie business owners. Barrie’s key community business service providers have come together to deliver a comprehensive week-long schedule of events that will bring together the local business/entrepreneurial community to gain valuable business building tools, resources and connections. Register a float for Santa Claus Parade! The Barrie Chamber of Commerce is pleased to have a longstanding partnership with Santa; he joins us each year for this fun night parade that features fantastic lights, colours, and music. This year's parade is scheduled for 5pm on Saturday November 21st, 2015, and the theme will be "My Favourite Christmas Song" - we expect that our floats will pull in some really creative ideas from the wide variety of songs available, tying in the visuals from movies, tv, books, and plays to make this our most fun parade yet! 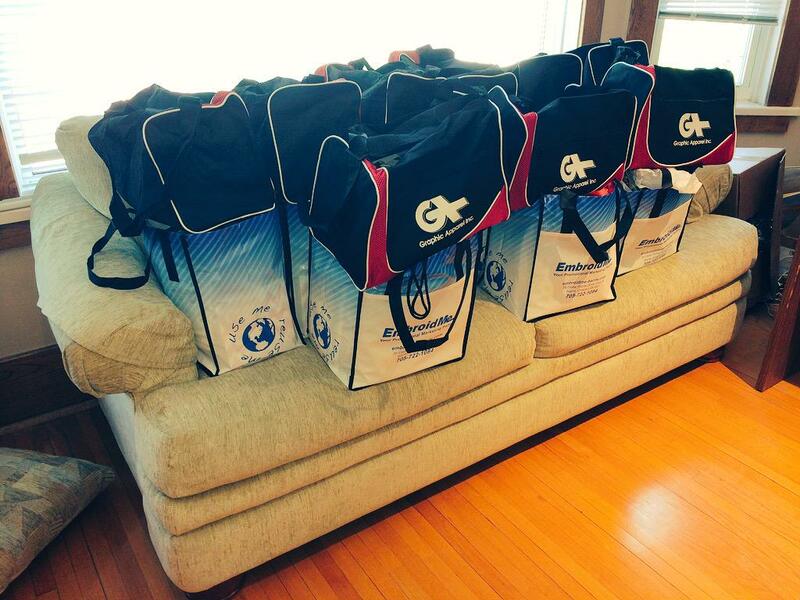 THANK YOU to everybody who contributed to the FMTU welcome packages! Recently, we put out an invitation to our members to donate to a welcome package for 9 family medicine residents learning and practicing at the Family Medicine Teaching Unit at RVH. As always, our members showed their generous spirits, donating a variety of items for a welcome package so big, it had to be spread out over 2 bags! On September 11th, we hosted 50 of our wonderful volunteers for an apprecation barbecue. 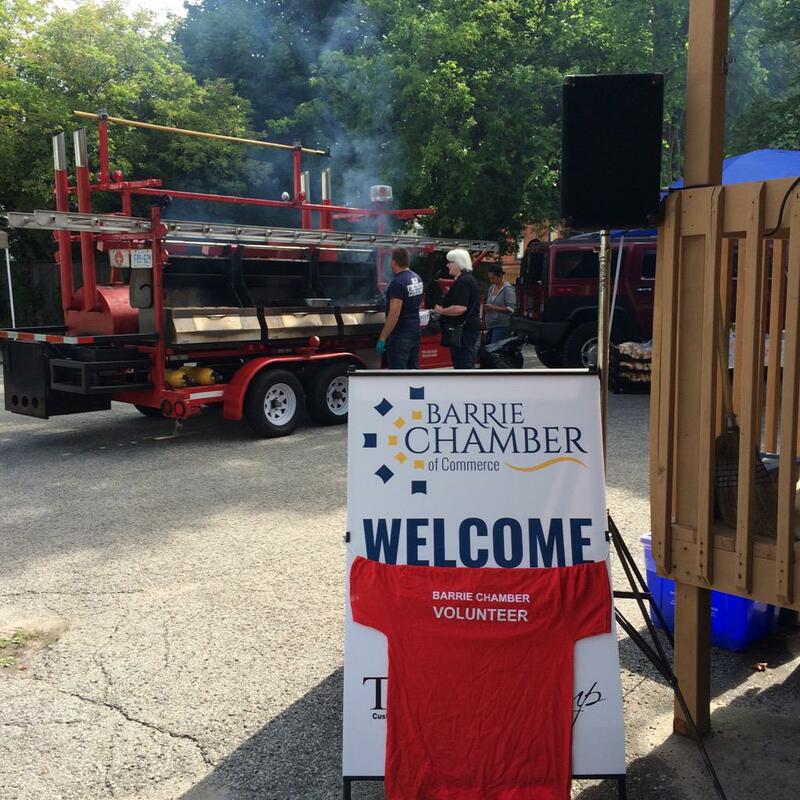 We had a great afternoon with them; volunteers play such an important role in moving the Barrie Chamber forward - THANK YOU very much to everybody that gives their time, creativity, energy, & support - we are very grateful to you all!! February 19 - 10 Day trip to Peru - watch for details very soon!